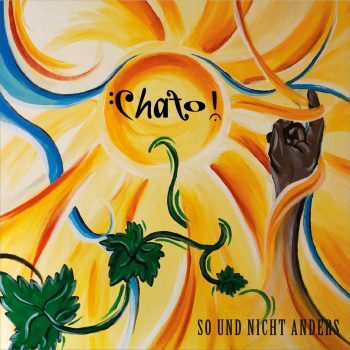 Germany's musical genius Chato Segerer surprised me a few years ago with his album Prog Fusion With Balls (2015, see review). An album that highlighted his love for fusion as well his love for Frank Zappa's music. Now, a good two years later Chato! is back with a new album. Let's see if I am equally impressed as I was before. So Und Nicht Anders has a slightly different overall sound to the previous album, his sound had expanded with extra instruments such as sax and flute, which is putting quite a mark on the album. So would that be better or worse? For me the addition seems to be a kind of natural growth in music. The Zappa track Let's Move To Cleveland has been jazzified a bit, highlighting brass elements and adding special guests on trombone and trumpet, but skipping the insane guitar solo of the original. What is left is an amazing and accessible version of a signature Zappa composition. As I referred to, the overall sound is different, but recognizable; some of the fusion elements have been replaced for a more middle of the road jazz approach, giving us the wonderful song Walking In The Streets At Midnight. But the ghost of fusion still realms over the opener Vilma and the following A 3-way On The Freeway. The latter highlighting powerful bass lines, strong clarinet parts and a soaring keyboard. But on top of these instruments, Chato gets to play his adventurous, sometimes heavy guitar parts and solo's. Making both very interesting songs to listen to. Citing the late Frank Zappa, “Does humour belong in music”, I guess the answer comes in the Music-Stereotypes-Medley, where all kind of musical styles merge into one big party of recognition. Name all the original artists and you might win a beer! Joke aside, this track is one you either like or just skip the next time you enter the CD into your player. The vocal addition on Never-Man adds a soft pop rock song to the album, accessible and pleasant to listen to, but also, miles away from the fusion and jazz of the first part of the album. More interesting for the progressive rock fan is the three part composition, Progtopia, where nice piano and keyboard parts and dense guitars form the base for an adventurous trilogy. Female vocals and plenty of brass are enhancing the progressive feel. The final track Tears Of Adrenaline is a song that features just Chato Segerer and his guitar, an impressive piece of inventive playing and a worthy closer for the album. So Und Nicht Anders is a pretty interesting album, covering a lot of different styles. For the open minded musical freaks, there's a lot to explore, if you just want to listen to one separated style, the road will be bumpy. But still, listening to other musical styles and elements ad incorporating them into one solid CD, That's prog! For me the trip was a very pleasant one, even though, sometimes the brass elements were preferred over some nasty sounding distorted guitars.